San Francisco: Back at the end of the last century, Nissan introduced a special offroad ride. The first generation Xterra was truckish, strong, and independent, not an SUV for soccer moms or family vacations, but a real transportation module for active lifestyles. You want leather seats? Better look elsewhere! 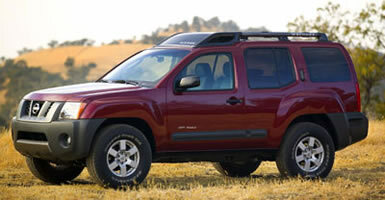 Every car or truck that sells well earns a redesign eventually, and for 2006, the Xterra got its turn. The bumped up mid-cabinroofline, blocky fenders, chunky grille, asymmetrical tailgate, fat tires, and utilitarian interior remain, but the Xterra is thoroughly updated. Motor Trend magazine liked the new Xterra so much that they awarded it their Sport Utility of the Year award. Nissan gave the new Xterra the guts of the large Titan pickup and Armada SUV, while the previous model was based on the smaller Frontier pickup’s chassis. It’s beefy, able to haul 5,000 pounds and carry you and three friends to the mountains on a weekend jaunt. The tubular roof rack with crossbars and lid transports the gear you can’t stuff inside, and the rear bumpers have deep indentations to help you climb up to get it. The cargo hold has 10 utility hooks on the floor, sides, and ceiling, and a channel system in the floor lets you move your attachment points. The flooring is the easy-to-clean type for messy things like muddy bicycles and waterlogged camping gear. Motivating this more than two-ton truck along is Nissan’s 4.0-liter 265 horsepower V6. It’s a half-liter larger version of the proven engine in the 350Z, Altima, and Maxima, specially formulated for off road intentions. You can order a six-speed manual or five-speed automatic transmission, and select from two- or four-wheel drive. It’s hard to imagine getting one without 4WD, but if you really don’t plan any rock climbing or snow adventures you may be able to live without it and save a little weight and cost. Fuel economy is posted at 16 City, 21 Highway. With the automatic transmission I averaged a respectable 15.7- mpg for such a rugged SUV. The Xterra may be tough and straightforward, but it’s high tech under all that sheet metal. Things like engine speed-sensitive power-assisted rack-and-pinion steering and 4-wheel disc brakes with Anti-lock Braking System (ABS) with Electronic Brake force Distribution (EBD) impart safety. Riding in the Xterra is amusing, even in normal traffic. It has presence, and the 265 horsepower engine makes it feel powerful every time you press on the gas. It’s like you’re on an adventure, even if you’re only commuting to your cube or picking up that late night carton of milk for tomorrow’s breakfast. My friend Fred, who just bought a new Xterra, likes the added power and numerous improvements over the old Chevy Blazer he drove for years. The Xterra’s inside is ultimately practical, and the various surfaces are blended nicely to give a sense of durability and longevity. The dash shape rolls forward authoritatively, while the center console is a log with useful storage and cupholders. The seats are covered in a breathable fabric, so you won’t stick to them in the heat or cold. There’s a handy dual glove box for small stuff too. You don’t have to be wealthy to own an Xterra. The new X model starts at just $20,655. That still gets you a limited slip differential and tough box steel frame, but lacks the extras available upline. The S model brings in alloy wheels, keyless entry, cruise control, a security system, and power windows, locks and mirrors. The Off Road model is set up for true Rubicon Trail riding, with hill descent control, hill start control, special Bilstein shocks, fog lights, and more. The SE is the top of the line, with a leather steering wheel (but not seats), 17-inch alloys, a killer Rockford-Fosgate 380-watt stereo with 9 speakers plus subwoofer, and more. Many standard features of the higher levels can be ordered optionally on the lower models. My test vehicle, in Night Armor (dark gray) paint, was an SE with four-wheel drive, so it was pretty loaded. Only four options appeared on the window sticker, the most important one was the roof mounted curtain airbag and front seat side impact bags. XM Radio adds fuel to the fire of the potent audio system. Pricing ranges from previously mentioned $20,655 X model up through the S, which starts at $22,855, the Off Road at $24,455, and finally to the SE at $26,355. My tester, with options, said $29,525 at the bottom of the sticker. Column Name: Are you ready for an Adventure?